In 2018 the Festival of the Wesak full moon in Taurus occurs on Sunday, April 29 at 5:58 pm PDT ~ 00:58 UT Monday, April 30. To listen: Click on the link in this list of available audio clips, or else you can scroll below to read the words, and link from there to each of the audio programs. Note: These audio clips are in MP3 format. If you are unable to hear them when you click below with the words given, you probably need to re-set your preferred application within your browser. And, if your browser creates an interfering window when you click to listen, you should be able to bring this text window forward to follow the words, while the clips play. There are three major festivals on this planet which form the spiritual high point of the year. These occur in the Spring. The first is the Festival of the Risen Son [Sun] or Easter, which is celebrated in the western hemisphere at the Aries full moon. The second is the Festival of the Wesak or of the Buddha, and is celebrated in the East at the Taurus full moon. The third is the Festival of Goodwill which occurs at the Gemini full moon and celebrates the spirit of humanity, which is dedicated to right human relations and which aligns itself with the will of God. These three festivals can be a means of achieving a great spiritual unity throughout the planet. The Taurus full Moon marks the second of these planetary festivals, The Wesak. The forces of enlightenment are active right now. These forces emanate from the heart of God and transmit divine understanding, strengthening those who serve humanity. The first to be affected by them are the great educational movements, the forums of the people in all lands and the values which can unfold through the mass communications media. As the new emerging ideas are recognized, they can then be directly channeled to influence the masses of the people everywhere. Those who seek the path to Enlightenment must first remove all ego pride and humbly be willing to accept the light of the Truth. All the treasures of the world, all its gold and silver and honors, are not to be compared with wisdom and virtue. To enjoy good health, to bring true happiness to one's family, to bring peace to all, one must first discipline and control one's own mind. Anyone who can control the mind can find the way to Enlightenment, and all wisdom and virtue will naturally come. Just as treasures are uncovered from the earth, so virtue appears from good deeds, and wisdom from a pure and peaceful mind. To walk safely through the maze of human life, one needs the light of wisdom and the guidance of virtue. The Buddha's teaching, which tells people how to eliminate greed, anger and foolishness, is a good teaching. And those who follow it attain the happiness of a good life. One, Suffering ~ Suffering and frustration come from our difficulty in facing the basic fact of life that everything around us is impermanent and transitory. Rich or poor, average or gifted, all life is subjected to the following: the trauma of birth, the pathology of sickness, the fear of physical and mental degeneration, the phobia of death, and karmically to be tied to what one distastes, or to be separated from what one loves. All things must arise and pass away. The second noble truth is desire. The cause of suffering and frustration occurs because out of ignorance, we divide the perceived world into individual and separate things. The desire to pull apart from the rest of life and seek fulfillment for the separated self, at the expense of all other forms of life, causes suffering to the whole, as Life is One Being. Our duty to our brothers and sisters is to understand them as extensions, other aspects of ourselves, as being fellow facets of the same reality. The third noble truth: Suffering and Frustration can be ended. If the cause of lifes suffering is those inclinations which tend to continue or increase separateness, in fact all forms of selfish craving, then the cure lies in overcoming such cravings. If we can be released from the narrow limits of self interest into the vast expanse of universal life, we will be free of our torment. The fourth noble truth is the Eightfold Path: The overcoming of desire is through the substitution of the personal wants into divine inclination. 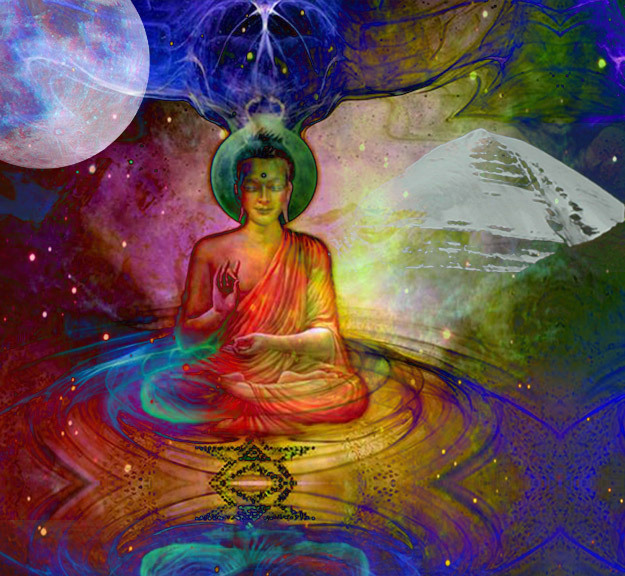 The way out of our captivity is through the Eightfold Path of Enlightenment. Right Knowledge leads to Wisdom. Right Aspiration leads to Divine Inclination. Right Speech leads to Truth and Understanding. Right Behavior leads to Goodwill. Right Livelihood leads to Sharing. Right Effort leads to Highest Outcome. Right Mindfulness leads to Purposeful Living. Right Absorption leads to Unity. For the next few moments we will celebrate the second of The Three Major Planetary Festivals, The Festival of The Wesak. For this ritual, we invite you to join us in a meditation which requires a glass or vessel of water, that can be placed next to you ... so feel free to relax, breathe deeply, close your eyes, and experience this visualization as we tune into the ceremony of The Wesak and contemplate its meaning. There is a valley lying at a rather high altitude in the foothills of the Himalayan-Tibetan ranges. It is surrounded by high mountains on all sides except towards the northeast, where there is a narrow opening in the mountain ranges. The valley is therefore bottle-shaped in contour, with the neck of the valley to the northeast, and it widens very considerably towards the south. Up towards the northern end, close to the neck of the bottle, there is to be found a huge flat rock. There are no trees or shrubs in the valley, which is covered with a kind of coarse grass, but the sides of the mountains are covered with trees. Approaching the time of the Full Moon of Taurus, pilgrims from the surrounding districts begin to gather. They find their way into the valley and fill the southern and the middle parts, leaving the northeastern end relatively free. There, so the legend runs, gathers a group of those Great Beings Who are the custodians on Earth of God's Plan for our planet and for humanity. This group of Knowers of Divinity are the main participants in the Wesak Festival. They arrange Themselves in the northeastern end of the valley, and in concentric circles according to the status and grade of their initiatory development, prepare Themselves for a great act of service. In front of the rock, looking towards the northeast, stand Those Beings Who are called by their disciples the Three Great Lords. These are the Christ, Who stands in the center; the Lord of living forms, the Manu, Who stands on His right hand; and the Lord of Civilization, who stands on His left. These three face the rock upon which rests a great crystal bowl, full of water. As the hour of the full moon approaches, a stillness settles down upon the crowd, and all look towards the northeast. Certain ritualistic movements take place, in which the grouped Masters and their disciples of all ranks take up symbolic positions and form on the floor of the valley such significant symbols as the five-pointed star with the Christ standing at the highest point; of a triangle with the Christ at the apex; or a cross, and other well-known formations, all of which have a deep and potent meaning. This is all done with the sound of certain chanted words and esoteric phrases, called mantrams. The expectancy in the waiting, onlooking crowds becomes very great, and the tension is real and increasing. Through the entire body of people there seems to be felt a stimulation or powerful vibration which has the effect of awakening the souls of those present, fusing and blending the group into one united whole, and lifting all into a great act of spiritual demand, readiness, and expectancy. These three words ~ demand, readiness and expectancy ~ best describe the atmosphere surrounding those present in the secret valley. The chanting and the rhythmic weaving grows stronger. All the participants and the watching crowd raise their eyes towards the sky in the direction of the narrow part of the valley. Just a few minutes before the exact time of the full moon, in the far distance, a tiny speck can be seen in the sky. It comes nearer and nearer, and grows in clarity and definiteness of outline, until the form of the Buddha can be seen, seated in the cross-legged Buddha position, clad in his saffron-colored robe, bathed in light and color, with his hand extended in blessing. When he arrives at a point exactly above the great rock, hovering there in the air over the heads of the three Great Lords, a great mantram, used only once a year at the Festival, is intoned by the Christ. And the entire group of people in the valley reverently touch their foreheads to the ground. This Invocation sets up a group vibration or thought current which is of such potency that it reaches up from the group of aspirants, disciples and initiates who employ it, to the very presence of God. It marks the supreme moment of intensive spiritual effort throughout the entire year, and its spiritual effects last throughout the succeeding months. The effect of this great invocation is universal or cosmic, and serves to link us up with that cosmic center of spiritual force from which all created beings have come. The Blessing is poured forth and the Christ, as the representative of humanity, receives it in trust for distribution. Slowly then, the Buddha recedes into the distance until again only a faint speck can be seen in the sky, and this eventually disappears. The whole ceremonial blessing, from the time of the first appearance in the distance until the moment the Buddha fades out of view, takes just eight minutes. When the Buddha has again disappeared, the crowd rise to their feet; the water in the bowl is distributed in tiny portions to the Masters, initiates and disciples, and they then go their way. The crowd, who have all brought their little cups and vessels of water, drink of them and share with others. In this beautiful water ceremony of communion is portrayed the symbol of the Aquarian Age, the age of the Water Carrier. The water, which has been magnetized by the presence of the Buddha and of the Christ, carries certain properties and virtues of a healing and helpful nature. Thus blessed, the crowd silently disperses. One interesting feature in connection with this Festival is that all over the world, those of many different faiths and religions have witnessed this ceremony in their dream life. It is an interesting sidelight upon this ceremony and its reality that all who have dreamt of participating in it are always well aware of the exact position in the lower part of the valley where they themselves stood. Some few realize that the place and the position within the body of onlookers indicate quite clearly the evolutionary status of the participant. Behind the grouped Masters, adepts, initiates and senior workers under God's plan, are to be found the world disciples and aspirants in their various grades and groups, either "in the body" or "out of the body," who constitute at this time the New Group of World Servers. Those present in their physical bodies have found their way here by ordinary means. Others are present in their spiritual bodies, and in the dream state. The "dream," which they later relate, may it not be the physical recognition and the recollection of an inner spiritual happening? Glory to God. Each day we strive to honor Your presence within us. In your name we seek, we find, and we offer our very best. It is written that we are created in Your image. On this day we are gathered to celebrate the creation of one of Your divine children ... the Buddha, the Buddha, the Buddha. We honor his offering of the cup filled with the water that is his very, very best ... and we acknowledge that this is the very, very, very best the Earth has seen. Love ya Buddha, Glad to have you here. It's Wesak again, and The Christ is near. The forms are all ready, Humanity's in gear. The Buddha from Banares is with us, and it's great. The white elephant's appearance was all a part of fate. Just ridin' that moon chain in a conscious state. Buddha got this job cause his boss went kinda nuts. With only The Christ to help them clean it up! Now here's a little saying, "As above, so below"
Humans make mistakes, that's something we all know. Well Buddhas do too, it just takes a long time to show. As a disciple, things get sort of dual. Checkin' us out ta see if we can break our own rule! The Goddess is waiting, humanity's in gear! This inspiring poem was written during the organizational meetings of the United Nations which convened in San Francisco on April 25, 1945 (at the Wesak full moon, which occurred on April 27 that year), and was published in The Beacon, © 1990 by Lucis Publishing Co.